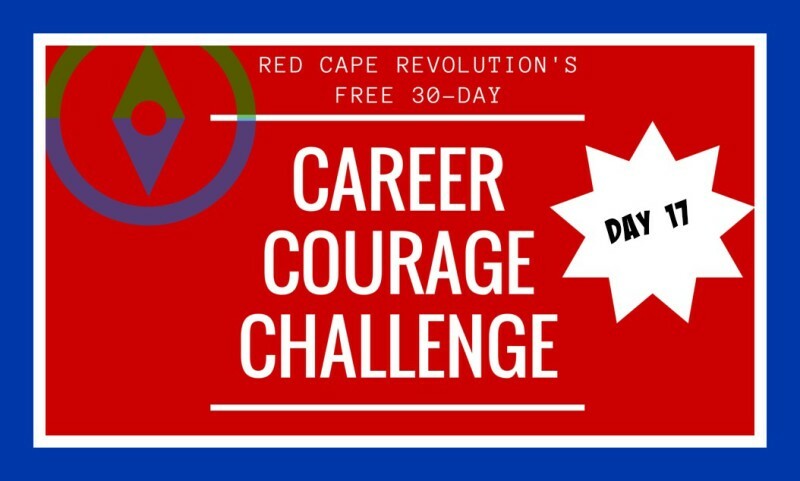 We are on Day 17 of our Career Courage Challenge, and this week has been a rich one! I hope you’re discovering more courage each and every day through these simple steps. Love it when you share in email or in the Comments at the end of this article, or on Facebook and LinkedIn, too. And remember, I’ve been taking the challenges along with you–just check out the Comments. In yesterday’s challenge, we noticed where we’re already brave. Give yourself a pat on the back for finding those. I hope you saw more places where you’re using your courage than you ever realized. Today, let’s dive into one of the biggest things that get in the way of being brave. It’s our excuses. And I know you have some. Me too. They’re just made up. We start to believe they’re real. What would happen if you just admitted that some of your excuses are just that—excuses? That they aren’t real? That they’re just a roadblock, and that you can make a different choice? Just for today, let’s admit to our best excuses, and recognize they’re not really real. For some prompts as to what you might be using as an excuse, watch my video below. My biggest excuse is typically “I don’t have enough time.” When I look at it with courage, I recognize that it’s really a lie–I have as much time as everyone else, as long as God keeps me here on this earth! I have to remember when I feel time crunched that it’s just an excuse, likely one for not making a tough enough decision about what’s most important at that very moment. What’s the excuse you’re using?